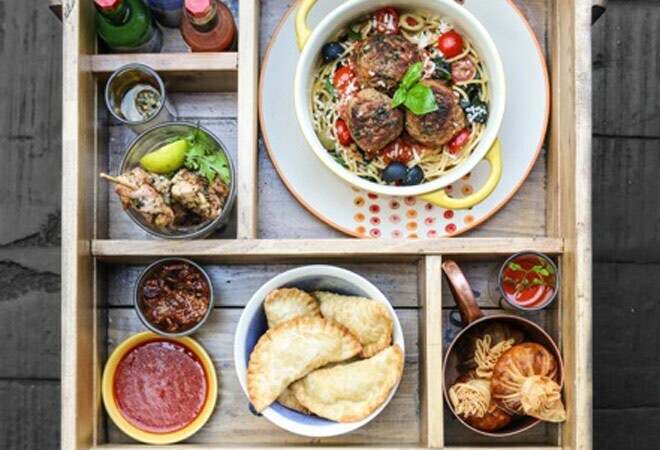 The new MoBox menu at Monkey Bar puts a twist on sharing plates. Premised on the excesses of a ginormous food culture that threatens to swallow everything in its wake is a prosaic meal plan thoughtfully rendered. The MoBox theme at Monkey Bar, which was started as a tongue-in-cheek romantic dinner for Valentine's Day observers, has transpired into something else entirely. There's nothing that spells love more than relinquishing that last morsel of succulent lamb or the crusty edge of a quiche slice. I can't recall the number of times I have found myself utterly anguished as a bit of bacon or cake I was saving for myself on a far corner of the plate was laid claim to by my eating partner. And, suddenly you find yourself bristling at such uncouth familiarity on their part. They say it's even worse for people on the cusp of 'seeing' each other. You want to go along with your love interest's choice of classy cuisine while your taste buds scream for some runny maacher jhol. Most eloquently portrayed in the Hollywood flick Made of Honour was this immutable relationship clause. Girl finds hot Scot guy who's nice, but just refuses to share his desserts with her. That's a deal-breaker. Monkey Bar's latest twist is the MoBox treat that promises to keep all manifestations of selfishness at bay. Heralding the mix 'n' match technique in food, it lets you pick a random selection of dishes that are smaller than mains. It also makes a cute reference to tiffin boxes lugged to school, surreptitiously opened in class and its contents bartered and emptied in the space of a few minutes. True to tradition, it was only after a considerable amount of squabbling over which small plates to order that the sister and I reached some sort of a grudging compromise. I am partial to the lavish, decadent side of the food spectrum as opposed to my sister, who makes a beeline for the light, low-calorie stuff. I am usually forced to capitulate, darkly muttering premonitions of 'I told you so's' when it doesn't turn out to our liking. Once you've decided on a combination, a hefty compartmentalised crate crammed with dips and condiments of every kind along with luscious starters arrives. The Mushroom Galouti, true to its name, is melt-in-the-mouth goodness perched on a brioche. It's cleverly executed and gorgeously light on the palate. Try it with the refreshing mint chutney and a smear of tamarind and date spread. We washed it down with the Citron, a heady concoction of Absolut, lime juice and Sugar syrup. The Rossini is a nice twist on traditional cocktails, with its blend of Strawberry puree and Chandon Brut. You also have the option of opting for the 'Do-It-Yourself' Cocktail MoBox and whipping up your own drinks. I would give the BYOB (Build Your Own Bruschetta) a miss. The toppings are many and varied in the form of tomatoes, ratatouille, pesto and parmesan, but not remarkable. My favourite was the Crab Rangoon - it has a lush, subtly seasoned filling of crab meat and cream cheese encased in a crisp wonton shell. The Chicken Chimichurri proved to be surprisingly good. Elevated above the average chicken tender with a parsley, coriander, chilli and vinegar glaze, it packs quite a punch. The smoky flavour doesn't hurt either. From mains, we tried the Castro-Pub Sandwich - a sedate, submarine sized burger. The Cuban bread it comes in is dense, but easy to chew on and holds forth its own despite the luscious contents of the sandwich. Thick slabs of bread that diminish the flavour of the filling is a common grouse. This oval, dome shaped creation is far removed from such considerations. The layers of refined flavours in the form of pork belly braised in beer and orange, ham, cheese, pickled onions and gherkins are perfectly rendered. The pork is soft and flavourful and cuts through the stronger strains of ham and cheese. This one's a sure keeper. The sweet note was provided by the rum-scented carrot cake dotted with carrot chips. It has a muted undercurrent of alcoholic essence but is more halwa than cake. You won't regret giving this box a try.